Europe's largest regional airline, Flybe has announced that it is adding a new route from Robin Hood Airport Doncaster Sheffield, the regional airport for the Sheffield city region. From October 30, the route to Dublin will take off with Flybe replacing the Aer Lingus Regional service operated by Stobart Air. It will operate six times a week flights ensuring that 40,000 seats are on offer from the airport. 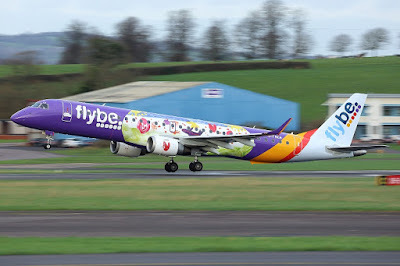 A "transformational deal" with Flybe was signed last year and eight new routes launched in April with 44 departures per week and almost half a million seats on the new routes in their first year of operation. The new routes are Paris, Amsterdam, Berlin, Jersey, Newquay, Malaga, Alicante and Faro. Flybe, a budget airline operator listed on the stock exchange, is in the middle of a three-year restructuring plan after struggling with mounting costs. Since April, new routes have been announced for Dusseldorf and Chambery in the Rhone-Alps region of south eastern France. Vincent Hodder, chief revenue officer at Flybe, said: "We are really pleased that we can offer Yorkshire travellers a continuing service between Doncaster Sheffield and Dublin, one of Ireland's most vibrant and cultural cities. We have timed flights to maximise convenience. The early weekday flights mean that business travellers can make the most of having a full working day, and there is more opportunity for travellers wanting to travel onwards to the US and Canada." Steve Gill, chief executive of Doncaster Sheffield Airport said: "We are delighted to announce this new route with Flybe, it is a welcome boost to business and leisure travellers alike, who enjoy visiting the Irish city and the onward connectivity it offers to America and Canada." "This further strengthens our relationship with the airline and we are really pleased to see the growth and diversity in the routes offered by Flybe since their launch earlier this year. Dusseldorf, Chambery and now Dublin have been added to the original roster." The airline has also announced that a new onward connection will mean that travellers to Jersey can easily get to the other destination in the Channel Islands, Guernsey. At the same time, Wizz Air, has started a new twice a week service to the city of Cluj in North West Romania, and starting from December 2016, the largest low-cost airline in Central and Eastern Europe will operate a new route from DSA to Sofia, the capital and largest city of Bulgaria. Steve Gill added: "We have been delighted to welcome our first passengers to Cluj in the heart of Transylvania. "We are delighted to see this further expansion with Wizz Air and we look forward to continuing to work with them closely to explore further opportunities from Doncaster." Doncaster Sheffield Airport is Wizz Air's second largest UK airport after London Luton and currently offers flights to 12 destinations. Owain Jones, chief corporate officer at Wizz Air, said: "Earlier this year Wizz Air celebrated carrying six million passengers on our Cluj-Napoca routes. We are delighted that now, as well as the daily flights operating out of London Luton, we can offer our passengers travelling from Doncaster Sheffield the opportunity to fly direct to the one of Romania's most charming cities." More than 200,000 passengers travelled from Doncaster Sheffield Airport this April and May. With the launch of the new routes, 93,921 passengers travelled in April, the best April figure since the airport opened in 2005.